Should I pursue a Ph.D.? How much do Ph.D. programs cost? Do I need a master’s degree before I apply to Ph.D. programs? Should I take a gap year before applying to a Ph.D. program? How do I prepare for applying to Ph.D. programs? I got a low GRE score / my GPA is low…will I still be able to get into a Ph.D. program? How do I find and choose Ph.D. programs that I want to apply to? I have a question about Ph.D.s that was not asked in this FAQ section! A Ph.D. (Doctorate of Philosophy) is the highest academic qualification in American education. A Ph.D. is a research-based academic degree that one pursues after completing a bachelor’s degree. It can be in any academic discipline (science, humanities, social sciences, engineering, etc.) and typically includes 2-3 years of coursework covering discipline-specific theory and curriculum followed by 3-5 years of independent, original research (your dissertation). In addition to theory and research training, Ph.D. students will also gain experience in teaching undergraduate courses. I greatly enjoy or am interested in conducting research to answer questions, generate new knowledge, and address problems or concerns within my field / discipline. I want to become an expert within my field / discipline. Most professionals in the position that I wish to hold or doing the work that I want to do have a Ph.D.
then you should consider pursuing a Ph.D.–even if you have doubts about your ability! A strong interest and motivation coupled with perseverance and a dogged determination can do a lot to build up one’s skills for graduate study. On the other hand, “I don’t know what else to do after graduating” is probably not a great reason to apply to Ph.D. programs. As stated above, Ph.D. programs are long, and they can be arduous, requiring a lot of dedication and commitment in order to complete. Basically, getting a Ph.D. should put you in a situation where you’ll be excited and interested by what you are doing; it should not be a means by which you avoid a situation that makes you feel anxious or afraid. Ideally, students are PAID to conduct their doctoral study and research. Ph.D. programs typically can offer students partial or full funding (financial support), covering both tuition costs and living expenses. Funding packages typically require graduate students to render service to the department as a teaching, research, or graduate student assistant. Additionally, there are many fellowships and grants available that can provide financial support for doctoral study. While there tends to be more robust funding found in STEM disciplines over the humanities, with some hustling, students can and do find ways to fully finance their Ph.D. education, even within disciplines with tighter budgets and less guaranteed funding to offer students. There are many more opportunities to find departmental and external funding for Ph.D. programs than for master’s programs. Some Ph.D. programs accept students straight from undergraduate studies, other Ph.D. programs (such as those in Education or Social Work) require or strongly prefer candidates with a master’s degree. That said, even within the Ph.D. fields that typically require a master’s degree, there can usually be found a at least a few Ph.D. programs that allow direct from undergraduate applications. There are many reasons why taking a gap year between undergraduate and graduate school might make sense: family obligations; post-baccalaureate research or professional experiences that will uniquely advance your skills or explore your interests in a way that cannot be done through graduate school; needing a mental break before dedicating oneself to 4-5+ years of additional academic study. 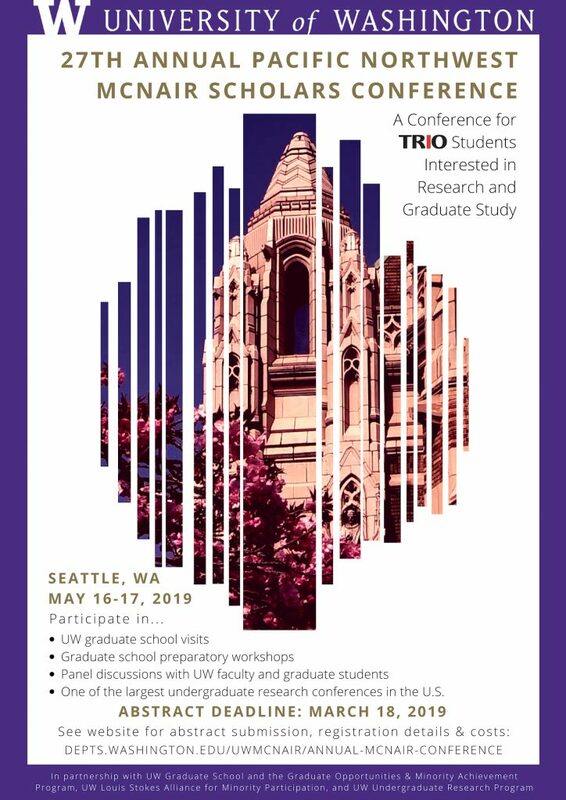 However, our recommendation is that you do not wait and that you apply to Ph.D. programs (or master’s programs if your discipline requires a master’s degree first) in your last year at UW. 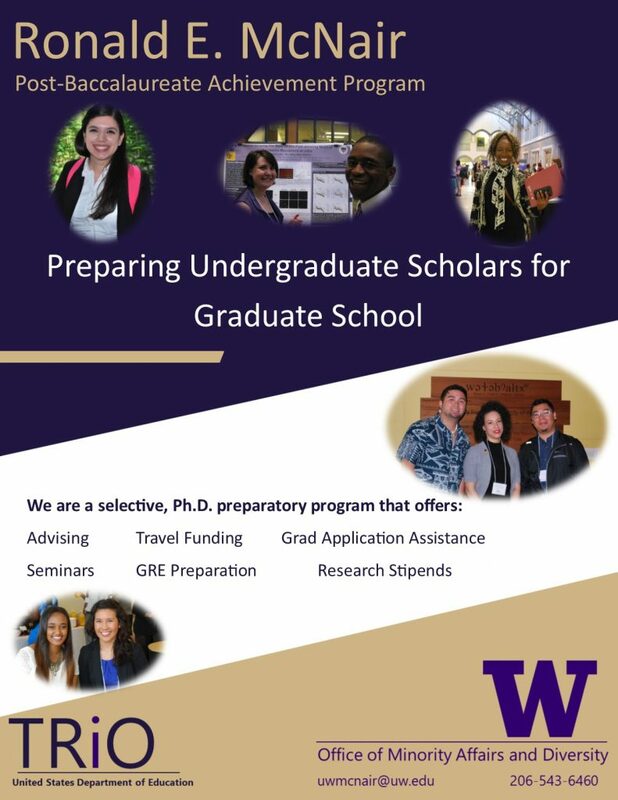 Ph.D. program acceptances can often be deferred for a year, and we want students to have the opportunity to apply to doctoral programs while they have full access to the support and resources the UW McNair Scholars Program and other campus offices can offer during the graduate school application process. Additionally, data shows that the longer students spend outside of academia, the less likely they are to follow through and apply to Ph.D. programs. Do not wait to apply, but once your options are on the table, you can then make the decision about whether taking a gap year is the right decision for you. Other than affiliating with the McNair Scholars and Early Identification Programs, your best preparation for applying to a Ph.D. program will be to conduct and present undergraduate research. Because doctoral programs are research-based, requiring that Ph.D. students conduct and report on an original independent research project (their dissertation) that takes place over the course of several years, applicants who bring in research experience and skills are typically more able to demonstrate that they have the training required to be successful in a graduate program. and so, to be a competitive applicant, you’ll want to pursue any experience or connection that will help you make these application materials as strong as possible. Other than research, other experiential learning opportunities such as study abroad, internships, capstone projects, and senior thesis projects are all opportunities to acquire beneficial experiences that build your skills and knowledge and can be added to your CV, spoken about in your essay, and connect you with faculty mentors and supervisors who can serve as letter of recommendation writers. Advanced coursework or training (taking graduate courses, specialized workshops, summer programs) can also be useful in a similar way. Finally, having a clear sense of purpose around why you want to pursue a Ph.D. as well as the ability to articulate why you are interested in specific graduate programs and program faculty will serve you in good stead as you write your essays, reach out to and network with potential graduate faculty mentors, and prepare for graduate school interviews. Notice that in the above question, neither the GRE nor GPA were highlighted as the most important factors in the Ph.D. application. While GRE scores and GPA may become more important with highly competitive programs, in general, strong research experience and letters of recommendation can compensate for mediocre or lower test scores and GPAs. With the GRE, many Ph.D. programs are moving away from requiring the test (hooray!) and the programs that still ask for it often treat it as a gatekeeper; as long as students meet a minimum score, their application gets cleared for a more in-depth consideration that focuses on the CV, essays, and letters of recommendation. With many programs, you can find out from the admissions coordinators whether there is a minimum GRE or an average GRE score for admitted applicants. Use that score as your GRE goal, and don’t stress too hard about getting the top GRE score, especially if that effort would take away your time to pursue more beneficial experiences like conducting research or building relationships with future letter writers. With GPA, it is recommended that students have at least a 3.0 cumulative GPA and around a 3.5 discipline-specific GPA to remain competitive for Ph.D. applications. But, if you meet the minimum GPA requirements for a Ph.D. program that interests you, you should apply. Additionally, see if there are ways to talk about your GPA in a more positive light. Was there one disastrous quarter because of a major life event that brought your cumulative GPA down, but every other quarter you’ve been on the Dean’s List? Is there an upward trajectory for your GPA? Are there certain types of courses that you always do well in, i.e. you don’t perform as well in the gigantic lecture courses, but as soon as you’re in a smaller seminar or lab course (which will be much closer to your academic experience in graduate school), you do well? And so on. If the answer is yes to any of these questions or others like them, you can give the additional context necessary within your application essays to put a positive spin on your GPA. The number one factor in considering Ph.D. programs is “Fit & Match.” Because doctoral programs are so long with such a strong emphasis on research, your relationship with your graduate faculty research mentor is key to your success in a Ph.D. program. Look for Ph.D. programs with at least two program faculty (faculty can change schools, take sabbaticals, leave academia altogether, and you don’t want to be left with no one to mentor you) who are conducting research that overlaps with your research interests. Reach out to those professors via e-mail (or in-person through networking at research and professional conferences and summer research opportunities) to try and learn more about their research and to see whether they are accepting new graduate students. Search academic journals for studies and papers on topics that overlap with your research interests; if you see the same name over and over as an author, that’s probably a faculty member that you want to investigate. Talk with your faculty mentor(s) and any instructors, lecturers, grad students, post-docs, post-baccs, and researchers that you know to see who is conducting research within the discipline in the topics or areas that interest you. Network at discipline-specific research and professional conferences to find faculty who are conducting research that interests you. E-mail us at uwmcnair@uw.edu to ask your question over e-mail or set up an appointment! Do note that we provide assistance with the general Ph.D. application process. If your question is in regards to highly program-specific application requirements (i.e. what UW courses fulfill curriculum prerequisites, what time an application is due, proper formatting for application materials, etc.) or is highly discipline- or profession-specific (i.e. I want to do this niche job / work, do I need a Ph.D.? ), then we are not the correct point of contact. Instead, you should direct your inquiry to the program and admissions staff for the specific application in question or advisers, faculty, graduate students, and professionals within your discipline / field.